Explore scenic Lake Maggiore in Italy's beautiful Lake District on a half day trip from Milan. The fashionable lakeside town of Stresa is an approximate 1.5-hour drive from Milan and is surrounded by majestic snowcapped mountains. After spending some free time in Stresa, shopping or simply relaxing and enjoying the stunning scenery, you'll take a two-hour panoramic boat cruise on Lake Maggiore, visiting the Borromean Islands – Isola Madre, Isola dei Pescatori and Isola Bella.Explore scenic Lake Maggiore in Italy's beautiful Lake District on a half day trip from Milan. The fashionable lakeside town of Stresa is an approximate 1.5-hour drive from Milan and is surrounded by majestic snowcapped mountains. After spending some free time in Stresa, shopping or simply relaxing and enjoying the stunning scenery, you'll take a two-hour panoramic boat cruise on Lake Maggiore, visiting the Borromean Islands – Isola Madre, Isola dei Pescatori and Isola Bella.Lake Maggiore, also known as Lake Verbano, is the second-largest lake in Italy and is surrounded by picturesque villages. As you arrive in the lakeside town of Stresa, you will have free time to explore this quiet village, have a bite to eat or browse shops before heading out on the water on your boat cruise.On board the boat, you can admire the splendid lakeside villas and lush gardens; the mild Mediterranean climate ensures that an abundance of exotic and rare plants thrive year-round. Sit back and relax as you cruise around the Borromean Islands. Pass by Isola Madre before heading to Isola dei Pescatori, where you will dock and enjoy free time to explore, hit the shops or enjoy a light lunch. Next, it’s back on board the boat for a stop on the third island, Isola Bella, where you can visit the Borromean Palace and gardens (entrance not included) or discover the many shops, boutiques and cafés housed in historic buildings. Finally, you will rejoin the boat and cruise back to Stresa for your return Milan. Explore the streets of milan, looking for hidden gems, narrow lanes, evocative panoramas and urban art. 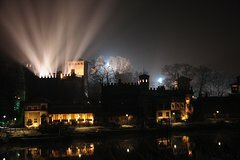 A professional photographer from milan will follow you and your frineds or family to capture the best moments together. Your photographer will ensure you return home with beautiful photos that will last for lifetime. Join an amazing 3-hour Milan group bike tour and discover the city's main monuments such as Sforza Castle, Arco della Pace, skyscrapers district, old canal lock, St. Maria delle Grazie, Ambrose church, la Scala, Galleria and Mercanti Square. Choose your departure time and enjoy the ride with the help of a licensed local guide. 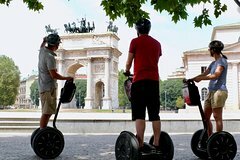 2-hour Milan Segway Tour with Canals, with a Milan licensed tourist guide, discovering Milan art and history, visiting the outstanding area of the famous Milan Canals, and some of the most evocative and interesting places of art and history of Milan. This tour lets you discover Milan with other participants with small groups. Included, at request, a photo session with customer's camera. Discover the best of Milan city center with a 3 hour and a half Segway tour led by a milanese licensed tourist guide. This tour is offered in the morning and afternoon, and lets you explore Milan with other participants in small groups. Discover the best of Milan city center with a 3 hour and a half Segway tour led by a milanese licensed tourist guide. This tour is offered in the afternoon, and lets you explore Milan with other participants in small groups. See the highlights of Milan's city center, discovering the city's art and history, on a 90-minute Segway tour with a licensed tourist guide. This tour is offered in the morning and afternoon and lets you explore Milan with other participants in small groups. The guide will, upon request, take photos of you in front of famous monuments with your camera. 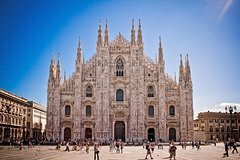 The Best Of Milan Tour With Last Supper Tickets & Milan Duomo Rooftop takes you to Milan’s world-famous attractions and introduces you to some of its stunning hidden gems. Forget everything you’ve heard about Milan, this tour will reveal the artistic, architectural, and historical beauty of this amazing city. Enjoy a 3-hour tour and admire Leonardo's masterpiece 'The Last Supper', the beautiful Duomo Cathedral in Milan, the unique Galleria and across the Brera area you we will reach the Sforza Castle. Capture Milan's latest architecture and wow your friends! Walking through the old city center, we bring history back to life with stories, images, delicious smells and tasting experiences. To do so, we selected 10 food-related entrepreneurs for their special relationship with the local food tradition and sustainable approaches to their daily activities. This is the perfect tour for whom is in Milan for a short time. In 1.5-hours you will visit the icon of Milan, the majestic Duomo Cathedral and its rooftop as you skip the lines. This small-group tour is limited to 15 participants maximum. In this 3 hour tour you will see all the highlights of Milan. A guided tour through the Majestic Duomo Cathedral, icon of the city and the beautiful Galleria Vittorio Emanuele II, the first prototype of the modern shops mall. Then you will see La Scala theater and walk down the charming Brera district, where you will see the typical houses with balconies full of plants and flowers.The tour then continues to the Sforza Castle, symbol of the power of Milan. Discover Milan in a half-day walking tour and get introduced to this stylish Italian city. Enjoy Milan in the most special way and find out that this city is not only rich in monuments, museums and masterpieces but also in magical, unknown spots. Discover Milan's cultural heritage as you spend 3-hours exploring the city center with a knowledgeable local guide. See the landmarks of Milan including the Duomo, and go for a stroll through the Galleria Vittorio Emanuele II, tour the legendary La Scala Theatre, including entrance to Milan’s Opera House. Discover where the Dukes of Milan lived at Sforza Castle, explore the hidden Piazza dei Mercanti, and much more. Discover the beauties of Turin with your Guide for a 3-hour walking tour of Turin’s classic sights, from the baroque palaces and porticoes of the old city center to its medieval Cathedral, house of the Turin Holy Shroud. The Royal City of Turin, undoubtedly Italy's best kept secret, was all but ignored for over a century even by the most discerning connoisseurs and academics. Boasting elegant squares, world class museums and a charming café scene, Turin is also remarkably free of the crowds that converge on most of Italy. Take a private Turin tour with a professional guide eager to show you the local hotspots and hidden gems in their beautiful city. 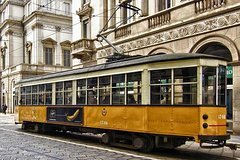 Experience Milan like a local and experience one of the historic trams on a 2.5-hour tour that takes in many of the top sights. Ttravel through the center of Milan aboard a tram, and get a chance to see the 19th-century Galleria Vittorio Emanuele II, a famous shopping district with a glass-vaulted ceiling. Visit the city's opera house—Piazza della Scala—along with the Piazza Affari and the monumental Milan Cathedral at the Piazza Duomo. 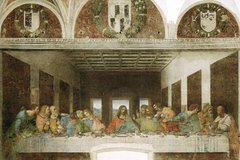 Discover the Leonardo Da Vinci’s Last Supper with skip the line tickets and a brilliant explanation by a professional guide. After the visit the tour continues with a stop at the beautiful little cloister of Santa Maria delle Grazie Church and then continue to the Church of San Maurizio which awaits with its collection of 16th-century Renaissance frescoes. Enjoy skip-the-line admission to see Leonardo da Vinci’s masterpiece, The Last Supper, and a guided tour of the Church of Santa Maria delle Grazie. You’ll also see Sforza Castle before boarding a vintage tram for a tour of Milan’s city center. Itinerary includes The Last Supper, Cordusio, Piazza Affari, the Duomo, the Galleria Vittorio Emanuele and Teatro alla Scala. Explore Lake Como by land and water on this full-day walking and boating tour, with a visit to Villa del Balbianello. Sample local cheeses, meats, olive oil, and wine, take a walking tour of Varenna and gain insight into the region’s Celtic heritage. Savor a tasty lunch of fish appetizers and pasta in a lakeside restaurant, then admire sweeping views over Lake Como’s villas and gardens during a sightseeing cruise in a Venetian taxi. Disembark at Villa del Balbianello for a guided visit, then cruise onwards to Bellagio, where you shall be guided through the wonderful Villa Melzi gardens, followed by a stroll along the lakeside. Unveil Duomo’s mysteries and get the most out of your visit with this private tour. Enjoy all the insights of this magnificent building and top off your experience with an exclusive skip the line ticket which gives you a priority access in the exclusive guide-only entrance. Enjoy unlimited internet everywhere in Italy with 4G-LTE Pocket WiFi. Stay connected anytime and avoid data roaming charges for your next travel in Italy. Passionate about Italian design? Combine traditional with modern design influences as you seek inspiration from museums, galleries, hotels and monuments showcasing the best of Italian design on this private guided tour. Visti Milan's showrooms, concept stores, workshops and ateliers. for a real sense of modern Italian design and style. Opera fans and theater lovers, this is the perfect Milan activity for you and an experience you’ll never forget! Join this La Scala Theatre and museum tour for a unique opportunity to discover the secrets of one of the most famous opera houses in the world. With an expert guide, visit the La Scala Museum, home to a fascinating collection of costumes, musical instruments and portraits. You'll also pass through the La Scala Theatre foyer and see its beautiful auditorium, stage and pit orchestra from the boxes! Get up close to one of the world’s most famous paintings on this 3-hour walking tour of Milan including a visit to Leonardo da Vinci’s ‘The Last Supper.’ With a local guide at your side, see the 'Atlantic Codex,' a 12-volume bound set of scientific drawings and writings compiled by da Vinci between 1478 and 1519, and enjoy a guided tour of the UNESCO-listed Church of Santa Maria delle Grazie. Then, skip the lines and enjoy an intimate viewing of ‘The Last Supper,’ undoubtedly one of da Vinci’s greatest masterpieces. Milan is one of the top fashion cities in the world but there is much more to see in this trendy, urban metropolis – it is also home to an incredible patrimony of art and culture which includes one of Leonardo DaVinci’s greatest masterpieces: the Last Supper. 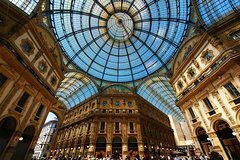 This walking tour celebrates the very hearth of Milano: Galleria Vittorio Emanuele II, the elegant corridor that connects the two most important squares of the city, Duomo and La Scala square. On the top you will enjoy the thrilling experience of a tour on its roof, the Highline Galleria, admiring the beautiful skyline of the city. 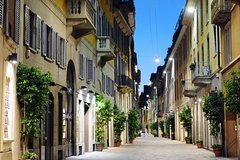 Embrace Milan’s passion for fashion on a full-day independent shopping trip to Vicolungo The Style Outlets (L’Outlet Village Vicolungo) – an enticing shopping outlet just outside the city. With round-trip transport by coach included, this trip allows to you to shop for internationally acclaimed brands like Armani and Tommy Hilfger at heavily discounted prices. Save between 30 and 70%, and then enjoy further additional discounts with your special tourist card – only available by booking this tour! Discover Milan and see da Vinci’s masterpiece, The Last Supper, on this 3.5-hour tour. Visit the UNESCO World Heritage site of Santa Maria delle Grazie to admire 'The Last Supper.' Demand is high and the queues get long to see this masterpiece; choose this best-selling tour for advance booking and entrance tickets. Explore La Scala opera house with your guide. Marvel at the scale and beauty of Milan Cathedral and learn of its long history. Explore the Galleria Vittorio Emanuele shopping arcade, a highlight of Italy’s fashion capital. Shop and save till you drop on this day trip to the Serravalle Designer Outlet from Milan, with round-trip transfers. On arrival at Italy’s largest designer outlet, browse the nearly 200 stores and enjoy up to 70% off brands such as Calvin Klein, Bulgari, Nike and more. For more benefits, upgrade to the VIP Shopping Pass and, as well as the 10% discount, enjoy fast-track coach boarding and a 10 euro lunch voucher. Choose from three departure times and durations to suit your schedule. Only got a few hours to spare between flights and don’t think you’ve got time to squeeze in some sightseeing? Think again! With a Local Host by your side, make the most of the precious little time you have in Milan on a fully personalised experience which could take in the city’s top attractions if it’s your first time passing through, or immerse you in a local neighbourhood you've never visited before. Experience a taste of local life even on your layover as you explore the best of the city with a local, seeing the most famous attractions as well as the local spots just around the corner. Coast your way around Milan on a 3-hour guided Segway tour with an expert local guide. Get acquainted with your self-balancing electric Segway, and cruise through the streets to discover some of the landmarks of Italy's economic and fashion capital as you listen to commentary via your audio headset. Glide by Sforzesco Castle (Castello Sforzesco), Piazza del Duomo, La Scala opera house and other sights, and swing Corso Vittorio Emanuele II, the city's favorite shopping boulevard. Numbers are limited to eight people on this small-group tour for a more personalized experience. See Milan by night on a 2.5-hour Segway tour. Travel from the historical center to the city’s newest neighborhood, home to innovative architecture and futuristic skyscrapers. See the distinctive Unicredit Tower, Italy’s tallest building, as well as Bosco Verticale (Vertical Forest) and the huge Milan Central Station. Ride a Segway between the sights while listening to an audio guide and discover how and why this city is changing. 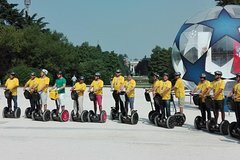 This small-group Madrid Segway tour is limited to eight people, ensuring a personalized experience. This 3-hour skip-the-line small-group tour will lead you to the Duomo cellar. While inside, your guide will unveil its mysteries, which are mostly unknown to the very same Milanesi. Special Offer - Book and travel byÂ November 30th and save 15% off our previously offered price! - Book Now! Always wanted to see Da Vinci’s painting “The Last Supper” in Milan’s church of Santa Maria delle Grazie? Now you have your chance! With this tour, you can skip past all the lines and see the extraordinary painting, hassle free. You will meet your guide in front of the entrance of the Last Supper Museum and get a brief introduction to the Italian masterpiece of the Renaissance. You will then head in to enjoy your 30 minutes inside the Museum and appreciate one of the most world-renowned works of art. The maximum group size for this tour is 15 people, food and drinks are not included on this tour. Do not miss the opportunity to visit the great exhibition of Picasso at Palazzo Reale di Milano. Skip the line and explore Picasso’s work with your licensed guide. 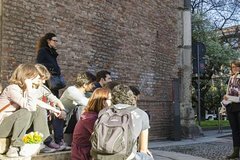 Explore centuries of Italian history and discover some of Milan’s most iconic attractions on this 3-hour walking tour with skip-the-line ‘The Last Supper’ ticket. Follow a guide through Milan’s ancient streets and beat the queues to admire da Vinci’s ‘The Last Supper’. Take in key landmarks including the Galleria Vittorio Emanuele II, Milan Cathedral, the medieval Piazza dei Mercanti, the UNESCO World Heritage–listed monastery of Santa Maria delle Grazie, Scala Theater and 15th-century Sforza Castle. Along the way, gain insight into Milan’s rich European heritage. Discover and marvel at the most important sites of Renaissance in Milan. 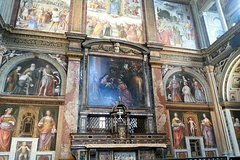 This 2-hour walking tour covers the must-see sites, including skip-the-line access to Leonardo da Vinci’s ‘The Last Supper’, but also hidden treasures such as the wonderful church of S. Maurizio, known as the ‘Sistine Chapel of Milan’. The knowledgeable local English-speaking guides will share with you their passion for Renaissance art and architectures, and will make you live a fascinating experience. Have a short time in Milan? Skip the lines and enjoy the city top sites with this full-day walking tour including Da Vinci’s Last Supper, tour of the Duomo inside and Michelangelo’s Rondanini Pietà. This walking tour of Milan (6 hours approx.) covers all the must-see sights including direct access to Leonardo da Vinci’s ‘The Last Supper’, the impressive Duomo Cathedral and Michelangelo’s “Rondanini Pietà”, his last unfinished marble masterpiece. The knowledgeable local English-speaking guides will share their passion for Milan and make you feel engaged all day long. With Skip-the-Line Access and guaranteed small group sizes you won’t waste precious time waiting in line and will live a more friendly experience. Enjoy a skip-the-line entrance to the Duomo rooftop and marvel at the impressive view of the city skyline, then take advantage of a special entrance from the rooftop and get directly into the Cathedral, avoiding any other line! 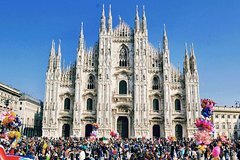 Experience this exceptional value Milan Duomo tour with this Super Saver, combining two amazing tours at a discounted price. This incredible 2-hour guided tour you will give you the chance to discover the most iconic building of Milan in a thorough, comprehensive visit. Let our professional, English-speaking guides share their knowledge about art and history with you and tell you stories of ancient rituals, curiosities and anecdotes about this imposing monument. Special Offer - Book this tour and save 17% compared to booking each tourÂ separately! - Book Now! Discover the most iconic symbol of Milan, the Duomo, and marvel at its majesty! Skip the long lines and enjoy this 1-hour guided tour of the inside of the Cathedral and the crypt below its altar. Let our professional English-speaking guides share with you their knowledge about art and history and tell you stories of ancient rituals, curiosities and anecdotes about this imposing monument! Enjoy an amazing view of Milan from above visiting the terraces of the Duomo with our professional, local guides! During this 1-hour tour you’ll get spectacular views over the city of Milan while walking on the rooftop of this majestic monument. You will be impressed by the countless gothic statues, spires and bizarre gargoyles decorating the outside of the cathedral while your personal guide teaches you about facts and anecdotes of the most iconic symbol of the city. Don’t miss the opportunity to visit Leonardo da Vinci’s masterpiece “The Last Supper” with an exclusive, extended night opening and to enjoy a taste of the best made in Italy food and wine at Eataly Milan. Italy is well-known worldwide for its incredibly rich art heritage and for the incomparable quality of its food. This tour combines these two, fundamental parts of the Italian culture and history and offers a once-in-a-lifetime experience. Combine two amazing experiences: visit Leonardo da Vinci’s masterpiece “The Last Supper” and enjoy an exclusive dinner at Eataly, where food and wine are always of the finest quality. Discover the city riding a beautiful bike alone or with friends. You will visit the most important monuments of the city riding a bike, the perfect way to discover all the hidden corner of Milan, away from noisy cars and traffic. You will enjoy the city like a local. No more selfies or pestering strangers for photos of yourself and loved ones, enjoy the services of a professional vacation photographer in Milan to capture your travels in a contemporary and candid style. Specialising in delivering quality photography with photographers all over the world, we guarantee you amazing photos to remember your travels. All images shown were taken by our photographers. Discover Milan's signature sights and gain skip-the-line entrance to Leonardo da Vinci’s ‘The Last Supper’ on this 3-hour small-group walking tour. With an expert local guide, explore the city center on foot to see top Milan attractions such as Milan Duomo, La Scala, Sforza Castle and other beautiful landmarks. Plus, breeze past the lines to view da Vinci’s masterly fresco: a sublime depiction of Jesus’ last meal with his disciples. Numbers are limited to a maximum of 25 people on this small-group tour to ensure personalized attention. Enjoy access to all areas of the Milan Duomo plus a 2-hour audio guided tour with this package. Visit the Church of St. Gottardo in Corte (closed on Wednesday), the Duomo Museum (closed on Wednesday) , the cathedral itself, and the archaeological area. Take in the sweeping views from the terraces on the Duomo's roof. Join this guided tour of Milan, the Italian capital of business and fashion. With this offer, you'll also get a skip-the-line ticket to explore the stunning Duomo with your private guide! Why spend your precious time waiting in long shuttle or taxi lines. Avoid the language barrier and currency exchange. Travel in style from Milan Malpensa Airport MXP to Hotel in Milan City Center by private vehicle and reach your final destination relaxed and refreshed. Meeting in the morning or afternoon an English-speaking licensed tour guide will lead you to discover Milan and its interesting and famous attractions, we will start to discover Duomo Sq the famous Cathedral. The tour will continue Mercanti Sq, and you'll get to admire the medieval heart of the city, hidden away from the crowded streets. After Mercanti Sq, we move to the Galleria dedicatd to our first King of Italy , after to enjoy walking into the Galleria we will move to the Opera House sq where we can enjoy the commentary about the square and the famous building around it. Skip the line during this 3 hours tour of Milan and see Leonardo da Vinci's 'The Last Supper' and 'Duomo Cathedral' the symbol of Milan. Then, take a walking tour of the city to see the best attractions of Milan......Duomo Square, La Scala Theatre, Affari Square...and more. Choose between two departure times when you book! In a small group limited to max 25 people, our guide will share Milan's stories throughout the tour. Join us on this wonderful 2-hour tour to discover the delights of the Duomo in Milan. This magnificent cathedral is an enduring symbol of Milan and one of Europes prime examples of Gothic architecture. You will be accompanied by a top-rated guide who specialises in working with children. The whole family will love this tour which will be fun but educational; packed with games and activities that will keep the children absorbed and will be a learning experience for the adults in the party as well! What better way to learn about the Duomo and the artworks that adorn this magnificent building; there are gargoyles, coloured stained glass windows, myriad shades of marble and numerous statues to see of saints and heroic figures from the past. You will also be taken to the Cathedral's rooftop - what a view! This is a super tour and with skip-the-line entry there will be no waiting in long queues. What are you waiting for - book now! Come to discover every corner which Milan hides with the finest scooter rental at the best price-quality ratio you can find. AROUND MILAN: BERNINA EXPRESS 1 DAY INDIVIDUAL EXCURSION. Available on week-ends and public holidays. Train from Milan Central Station to Tirano. Lenght of Travel: approx 2 hours and 30 minutes. Our WiFi hotspot uses the local carrier, providing you with fast and reliable internet wherever you travel in the county. A WiFi hotspot provides portable WiFi whenever you need it for your smart phone, PC and tablet device. Multiple devices can be used at the same time. Experience Italy's “Land of Motors” and see some of the world’s finest super cars and bikes. Join this 7-hour tour to the Ferrari Museum in Maranello, the Lamborghini Museum in the town of Sant’Agata on the Via Emilia and the brand new Pagani museum and factory! The tours includes high speed train tickets from Milan or Florence, according to option selected. Combine culinary and cars with this action-packed day-long tour of Italy's Bologna region. Depart Milan by high speed train and reach Bologna in only 62 minutes. Your guide and driver will pick you up upon arrival. Ride via minivan from the center of Bologna to the production centers of some of the area's most delicious and beloved treats: Parmesan cheese, balsamic vinegar and prosciutto. After sampling some of the edible delights, travel to the Ferrari Museum in Maranello where you can indulge yourself in the history of the prestigious car company and even test drive one (at own expense). Later, tuck into a six-course gourmet lunch. This small-group tour is limited to 19 participants, ensuring extra attention from the guide. Bypass the queue with your prebooked ticket to the top of Milan's Duomo — Milan Cathedral — the city's most notable attraction and one of the world’s largest churches. Take the elevator up the steepest portion of the church, followed by just 50 steps to the rooftop, where you'll enjoy sweeping views of Milan and admire the cathedral's statues, spires and buttresses up close. Learn about the history and significance of this Gothic masterpiece from your guide along the way. Experience the best of the Duomo on a Milan Super Saver that combines two popular guided tours at a discounted price. With an expert guide, enjoy skip-the-line entry to the iconic cathedral, then take a 1-hour tour of the interior before ascending to the rooftop. Ride an elevator and climb steps to reach the lofty rooftop, where — amid the upward-reaching spires of the cathedral — you’ll soak up gorgeous views of the city below. Beat the crowds at Milan’s Cathedral, or Duomo, with skip-the-line access during this 1-hour guided tour. Select from a weekend or weekday departure, then marvel at this glorious Gothic spectacle, one of the world’s largest churches. Accompanied by an expert guide, walk through the candlelit interior viewing the statues, spires and stained glass. Hear fascinating anecdotes and legends associated with the captivating cathedral. Descend into the crypt beneath the altar and see the tomb where the 16th-century archbishop Saint Charles Borromeo is buried. Fill your day with art, and see Leonardo da Vinci’s “The Last Supper” in Milan with a skip-the-line ticket. The biblical scene painting has become one of the world's most famous pieces of art. So skip past the long lines of people waiting to see it, and head straight inside for an up-close look at the masterpiece itself. From a knowledgeable guide, learn about Leonardo and the Renaissance, and take in the splendor of its setting, a Dominican convent near the UNESCO World Heritage–listed Church of Santa Maria dell Grazie. See the best of Milan in a single day on this 6-hour walking tour that also takes you to locally loved spots often missed by visitors. Your in-the-know guide will detail the history of the many sights you’ll see, for a level of insider’s perspective you can’t get with a guidebook. Plus, you’ll save time with special skip-the-line treatment at the Duomo di Milano and your choice between a visit to see 'The Last Supper' or Leonardo da Vinci's Vineyard. Bypass the long queues for both showstopper attractions and enjoy priority access to some of the city’s other famous churches, too. This best of Milan tour leads you to the most iconic and well-known Milan attractions, including the word-famous masterpiece 'The Last Supper' by Leonardo da Vinci. Among all the things to do in Milan, don't miss the opportunity to discover its must-see attractions on this 3-hour guided walking tour. A unique experience through the Majestic Symbol of Milan! Discover Milan's rich musical history on a tour through one of the world's leading Opera Theatres. How can you visit the central area and get a view in the open air without getting tired? Entrust the new way to visit Milan! You can stop where you prefer to take pictures of attractions comfortably sit on an electric bike and let yourself be led by your driver. See Milan by rickshaw on this 2 hours tour. You will receive admission to one of the most famous masterpieces in the world, Leonardo da Vinci's 'The Last Supper.' Enjoy the flexibility of your admission ticket, guaranteed for 24 hours before and within 24 hours after your tour. Discover Milan in a very special and suggestive way: during the evening venerating the sunset. Walk around the city centre and find out not only in monuments and masterpieces but also in magical, unknown spots full of intrigues and traditions. Experience a 30-minute, one hour or more, tour of the city aboard a vintage Fiat 500, a truly timeless classic. Try this new way of discovering the "City of Fashion" and let your tour leader guide you around the city. Small groups available! This portrait session put you squarely in the frame as you spend three hours in Milan, photographing you and your loved ones so you can share beautiful images of yourselves on your vacation. Come away with a selection of beautiful images to show your family and friends, as an elegant keepsake of your holiday. Rich in historical architecture and brimming with next season's haute couture, Milan provides endless photo opportunities. It's fast and determined during rush hours, but there are spots that were made for people watching. Follow along with your professional photographer-guide on your private tour as you explore the most captivating angles of Milan. You will demystify the complexities of your camera and find the best spots to capture the perfect shot. Choose from one of 2 departure times and durations when you book. Visit one of the Italian Renaissance masterpieces. Meet your guide at the meeting point just in front of Santa Maria delle Grazie Church. After a 15 minutes introduction to the Italian Renaissance, you will enter the Last Supper exhibit for a 15 minutes visit where you will get the chance to admire the famous mural painting. The accredited guide will reveal to you all of the masterpiece’s technical and artistic secrets: the new techniques used by Leonardo, his use of perspective and the hidden symbols of the painting. 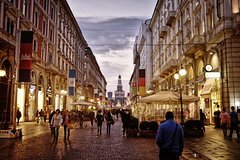 Discover the inner, charmed world of Milan's dazzling fashion district on this 3-hour small-group walking tour in the company of a friendly, local guide. This tour lets you in on the secrets and stories behind four of the most famous fashion streets in the world, lined with the top-name luxury boutiques. Soak up the glamour, gossip, and history of the eye-catching designer window displays framed by impressive buildings that line the Quadrilatero d'Oro. End on a chilled note in a top location. This alternative fashion tour combines culture, fashion, and fun. Enjoy the best Milanese cultural experience that offers a truly great combination of Renaissance art, appetizers, and wine with this 3-hour tour. Join a guide who specializes in art history on a tour that follows in the footsteps of Leonardo da Vinci. 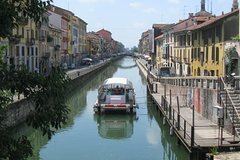 Discover the history of the city's canals known as the Navigli, now the city's top entertainment district. Chill out in true Milanese style over an aperitivo and glass of wine in one of the district's most characteristic spots and watch the people go by as things stirs to life. 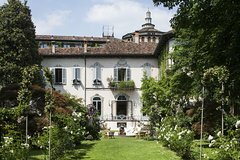 Just a few steps from the Basilica of Santa Maria delle Grazie we find the Atellani House, donated by Duke Ludovico “il Moro” Sforza to his courtiers, the Atellani family. It was purchased by Ettore Conti in 1919. Conti commissioned architect Piero Portaluppi to restore the villa. Leonardo da Vinci was a guest of this hisotric house placed near his vineyard, donated to him by Il Moro in 1499. These vines live again today thanks to the studies of enologist Luca Maroni and Professor Scienza. See Leonardo da Vinci’s world-famous masterpiece, The Last Supper. Afterwards, visit the very best of Milan on a guided walking tour through the city center. See La Scala, the Duomo and the Sforza Castle.